Sometimes I think that being a non-American puts me at a disadvantage, that a lot of references tend to go over my head and I’m left with the barren perception of an outlander to try and understand a situation I have no reference for. I’m left to evaluate stories, books and matters from a new perspective, like coming in on the end of the punch line of a joke and not knowing why everybody is laughing or enjoying it. This was my experience with Devil Bat Diary – The Journal of Johnny Layton. The book by Peter H. Brothers severed as a novelization of the 1940 PRC film “Devil Bat” an old comedy-horror staring Bela Lugosi. I had not seen the film before reading the book (quite hard to get films that old…) but thought that I’d enjoy the story regardless. It’s set against the backdrop of a sleepy America town, where a series of bizarre murders attract the attention of the city reporter Layton and his photographer David McGuire who go and investigate. Upon finding that the mysterious murders are giant ‘devil’ bats, the two men have to race against the clock to try and solve the mystery before it can kill another one of the family members who own a prominent cosmetics company around which the murders seems to be centered. This is definitively written for a selected genre of readers, those who hold a fondness for old films, for the over acting and the sometimes ridiculous humor that comes with scary ‘stuffed’ animals. If you expect damsels in distress to act against all common sense and fling themselves into the path of danger you’ll find it here. I think that Brothers stayed very true to the genre and kept the plot and story comfortable and easy. Unlike some of previous books that I’ve reviewed here, this is the first book that I could read in broken intervals without losing sight of the plot and characters. It flowed well and didn’t require a lot of thought to follow. There were amusing moments and Brothers was very good to paint out his characters as individuals. Unfortunately, it’s for a very selected genre of readers. If you’re not familiar with the genre of film and appreciative of the kind of work that you can expect from these old films this isn’t the book for you. The plot is thin, transparent and never quite build up to anything. As this is supposed to be a journal, I would’ve loved to see the author expand the tale through speculation and have the main character spend more time actually marveling at the horror of what was happening rather than constantly thinking about his partner’s sexual antics with the French maid. A lot of the scenes were also out of place and… just plain weird. I’m not sure whether I should be male or young to appreciate the comment of how a man’s naked backside can remind another of a lowland mountain gorilla. Through most of the book, I felt as if I was standing on the outside, looking into a world that made no sense to me what so ever. If you want to claim that a book is the ‘true’ story of the dramatized and misrepresented film, then you have to earn what you write. In films, characters just randomly fall in love but in books, if you write down the words “I love you,” you have to earn it. Make your characters earn it. I felt as if nothing was earned in this book. That the readers couldn’t become involved because the antagonist was immediately presented within two or three lines of his first dialogue. For someone who steps into the story for the first time, this makes it very hard to continue reading the book because you already know who killed the proverbial Colonel Mustard with a candle stick in the dining room. I also had a hard time with the way the author tried to bring ‘accents’ into books. Through most scenes, only about one out of every three characters will speak normally. The phonetic way of writing broke the sentences and made a lot of what was written flow into an unintelligible mess. One of my personal pet peeves is when I’m forced to reread a sentence to try and figure out what a character was saying. I don’t even appreciate it on television. If I had read the introduction better, I would’ve realized that he warned me against his sordid situations and vulgarity. 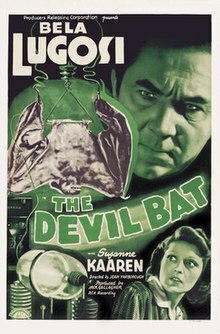 Where I was anticipating a frightening account of how one man tried to solve the mystery of the devil bat attacks, the author merely proclaimed that his intention was to provide an un sanitized version of the film’s events. That was his vision from the start and he stuck to it. It doesn’t necessarily mean that I have to like it, but he stayed true to his own artistic integrity. Did I like the book? Even with the film under my belt, I have to say no. Some things work in black and white on television but that doesn’t necessarily mean that it works in a book. My own conclusion that I’ve drawn is that this was an unnecessary ‘fleshing out’ of the film. That the intriguing little details and insights that the author provided into the characters were irrelevant and obscure. That it is genre bound is a given. I think you have to hold a deep love for cult horror films to appreciate this book. I think that as the author said, it’s the audience’s place to draw their own conclusion. This was mine, but you may find that yours is quite different. Devil Bat Diary; The Journal of Johnny Layton can be purchased from Amazon here.